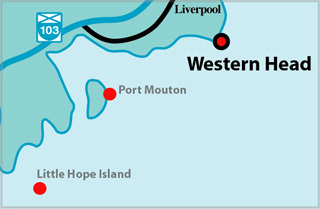 Western Head was originally established as a foghorn station only. The current lighthouse, built in 1962, is a fine example of a late-in-time concrete building. Sadly, the wooden foghorn building was destroyed. 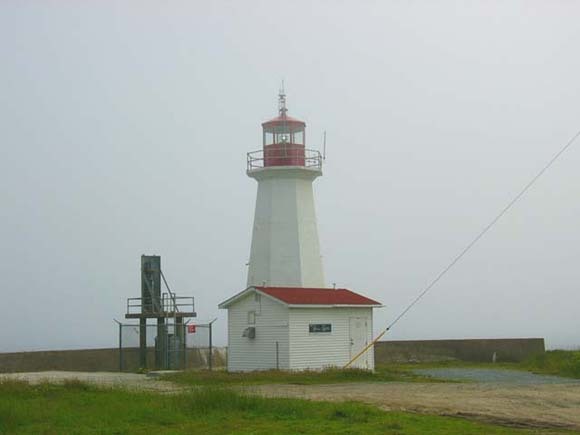 The current electronic foghorn stands to the left of the lighthouse. Western Head Fog Building and Keeper's House c. 1945. This fog alarm building was erected in 1928. The first operator was Avery Curry. Carl Hatt, took it over in 1930 and operated it up until his death in 1959. His son, Doug, was his assistant from 1947 to 1959. "My father helped choose the site for the station. Lawrence Wentzell was the operator after my father's passing," said Doug. Shortly after that it was turned into a lighthouse as well as a fog alarm station and now only a light house. There were three houses there at one time but they were all moved to other locations. " "I was so pleased to see pictures of the Western Head fog house. Hannah (Mrs. Hatt) was "Nanny Hatt" to us kids as we grew up. My parents, Ronald Frellick and Eva (Frellick) Burgess took us girls there to visit and spend fun times. I loved hearing the fog horn and still listen for it when I take a drive out around the place. I can remember once that Carl took my younger sister Rhonda and I over to check things for the night and he let us sing on the radio. We did sing "It's raining, it's pouring... " and were very proud little gals. Such good times were spent there. Seems strange with the buildings gone now. My sisters Nancy and Nina also have memories of the place."